“All Our Foolish Schemes,” the second book in Raymond Esposito’s The Creepers saga, is available now. Once again, Mr. Esposito’s writing evokes echoes of Stephen King and Richard Matheson, in this tale of a world gone mad. A devastating virus has swept the world, changing most of humanity into mindless, ravening monsters in a matter of days, sometimes hours. Even the government’s “extreme measures” could not contain this horrific virus, and the world changed to a terror-filled nightmare overnight. Too bad the zombies aren’t the only horrors the survivors have to face. Though the group made it out of Fort New Hope, they still aren’t safe. With some of them wounded—and changed more than they know—they are now in a desperate race to stay ahead of Connor, and his pack of undead monsters. There is no doubt the Creepers are changing, evolving into something even more horrific, and they face tough choices and insurmountable obstacles in their battle to reach a safe haven. But not all of them will make it out alive. 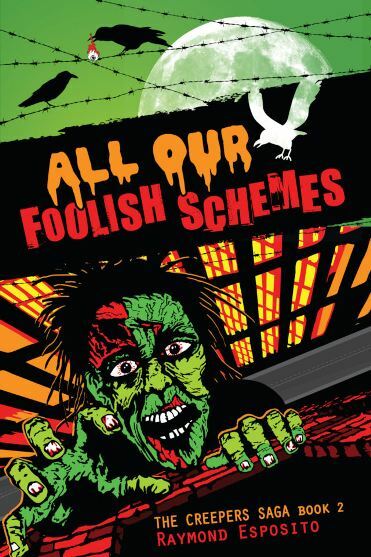 With more page-turning action and vibrant characters, “All Our Foolish Schemes” carries on the story of The Creepers saga. Amidst a dark and desperate world, the characters readers have come to know and love fight for their very existence while trying to stay true to each other.